Are you doing yourself a favour or a disservice when you substitute a spoonful of sugar with a sweetener? That depends. The recommendations will come with a caution: Artificial sweeteners should be used in moderation as they do not have any beneficial nutrients and are not known to have long-term health benefits for non-diabetic individuals. We spoke to a few experts on safe sweetener use. Isn’t sugar better than an artificial sweetener, being a natural food? Dr S.K. Wangnoo* (see Note) says, “Sugar substitutes do not cause any harm if used properly and within limits. Neither do they have side effects." Sugar, on the other hand, has its own set of problems. Dr Anoop Misra* says: “Consuming excess sugar raises the levels of the hormone insulin in blood. Insulin stores fat, which is a risk factor of diabetes, and can also cause heart disease. Too much sugar affects immune systems, lowering resistance to disease." Then everyone can benefit from artificial sweeteners? For healthy people, instead of adding sugar substitutes to the diet, just cutting down sugar intake by half is better, says Dr Wangnoo. So artificial sweeteners make for a healthy diet? “Only if you have an overall healthy diet with plenty of fruits, vegetables, whole grains and low-fat dairy, etc.," says Dr Swarupa Kakani*. Don’t they cause health problems? 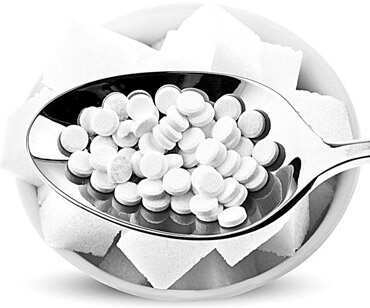 Theories on sweeteners causing various health problems, including cancer, are rife. Dr Wangnoo says, “According to the National Cancer Institute (India), however, there’s no scientific evidence that any of those approved for use (by the FDA) in the United States cause cancer. Numerous studies confirm that artificial sweeteners are safe for the general population. Some, like aspartame, do carry a cautionary note that it is not safe for people with the rare hereditary disease phenylketonuria (PKU)." Then it’s a win-win proposition? For diabetics, yes—with caveats (see Not-so-sweet truths). However, the common use of sweeteners to control calories by a healthy person, while not directly harmful, hasn’t been proven effective. Dr Misra says, “Long-term studies on these sweeteners have yet to be conducted to see the effect on glycaemia (blood sugar) and weight loss." Is a herbal sweetener better than a ‘chemical’ one? Here, opinion is divided. “Any sweetener, herbal or not, is okay—provided you have a healthy diet," says Dr Kakani. On the other hand, Dr Shikha Sharma* says the herbal sweetener Stevia is least likely to have side effects, being “natural" (it is derived from the Stevia plant). But honey and jaggery are also natural. Whether refined or not, honey, jaggery (gur) and table sugar are all simple sugars (as opposed to complex carbohydrates). Dr Wangnoo says, “Both honey and sugar will affect your blood sugar level, which is a problem for diabetics. Honey is sweeter than granulated sugar, so you might use a smaller amount. But honey actually has slightly more calories per teaspoon than sugar." So simply replacing a spoonful of sugar with a spoon of honey would be a bad idea. However, for a non-diabetic person, both of these are better than sugar, since jaggery provides some iron and honey contains traces of vitamins and minerals. So what’s my best bet? Stevia, sucralose and acesulfame-K have been shown to be very stable even at high temperatures. Therefore, they can be used safely during cooking, says Dr Misra. They also have the fewest safety problems. • Other ‘sugar’: Other ingredients in “sugar-free" foods can still affect blood sugar level. All carbohydrates, such as flour and even starch-based thickeners in yogurt, are broken down to sugar. • Not quite ‘sugar-free’: Processed foods such as cookies and chocolates that contain sugar alcohols (see table below), unlike other sweeteners, can affect blood sugar. • Calories aplenty: Foods containing sugar substitutes may still contain considerable calories, undermining weight loss and blood-sugar control. It’s one thing to have an occasional cup of tea with sweetener, quite another to eat “sugar-free" snacks with each cup. • The gut effect: Sugar alcohols (see table below) can have the same effect as laxatives. • No nutrition: Unlike natural sugar in fruits, vegetables and grains, which come with vitamins, minerals and fibre (which reduces the impact on blood sugar), artificial sweeteners have no nutritional benefits. It is not wise to substitute fruit with cola, for example. And while the occasional diet soda is fine, it should not be the only beverage you drink. • Menacing mix: Processed foods and drinks may contain more than one type of sweetener, and safe limits pertain to the use of one type only. So such foods can make it difficult to stay within your daily allowance or even monitor intake. This is a sweet-tasting protein extracted from the West African fruit of the climbing plant Oubli. It is 500-2,000 times sweeter than sugar. This sugar is found naturally in dairy products in small amounts, and is similar in texture to sucrose (table sugar). It is 92% as sweet as sugar, with only 38% of the calories. It can be produced commercially from lactose (natural sugar in milk) and has GRAS status (‘see table below’). The liquid form of Stevia is not widely available in India yet, though imported brands are stocked in select shops. Studies are also being done on other types of sugar alcohols, such as erythritol, lactitol and polyols, that taste like sugar but have fewer calories.